"I am determined that nobody experiences a worse outcome solely on the grounds of their ethnicity. Which is why the Government is making a clear and concerted effort, alongside higher education partners, to tackle these injustices. "These ethnic disparities in higher education cannot be tackled overnight, but I look forward to seeing meaningful and sustained progress in the higher education sector in the next few years." "Universities need to reflect modern Britain, and ensure that everyone who has the potential, no matter their background or where they are from can thrive at university. I fully expect access and participation plans, which universities will be drawing up this year for implementation in 2020-21, to contain ambitious and significant actions to make sure we are seeing material progress in this space in the next few years. "It is one of my key priorities as the Universities Minister to ensure that I work with universities to highlight examples of best practice in widening not only access, but also we redouble our efforts to tackle student dropout rates. It cannot be right that ethnic minority students are disproportionately dropping out of university and I want to do more to focus on student experience to help ethnic minority students succeed at university." "We are placing greater demands on universities to close the attainment gaps between ethnic minority students and others. We are also providing greater support for all universities to improve their practice in this area by funding collaborative projects and sharing effective practice. Our new approach to access and participation requires universities to improve their use of evidence and evaluation to identify the specific challenges faced by their own students, and to make interventions that work. "Where we see lower proportions of ethnic minority students continuing with their studies, achieving the best degree outcomes, or progressing into graduate jobs, we expect universities to have a measurable plan of action to address this. Today, we are publishing new research and guidance to support universities in effectively targeting their work for students from minority ethnic backgrounds, so they can make the changes that are needed if we are to achieve equality for all." "Tackling race disparity outcomes is important and we welcome the Minister’s visit to King’s today. I am proud of the diverse international community we have here at King’s, in 2017/18 49% of our undergraduates were from Black, Asian and other ethnic minority backgrounds, and we have the fastest growing population of low-income students in the Russell Group. "Over the past seven years we have significantly reduced the gap between Black, Asian and Minority Ethnic (BAME) students and non-BAME students achieving a first or 2.1, from 11.1% in 2011/12 to 3.8% in 2017/18. It is great for our staff and students to have the opportunity to engage with Government at such a high level in a pro-active and meaningful way as at the roundtable this morning. I look forward to working further with Government, partners and communities to build on the work we’re already doing to improve student attainment and staff progression, regardless of an individual’s background." 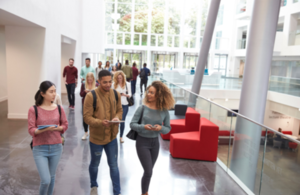 • Holding universities to account through their Access and Participation plans – scrutinised by the Office for Students who will use their powers to challenge institutions failing to support this. • Putting pressure on university league tables to include progress in tackling access and attainment disparities – working with a wide range of experts, stakeholders and league table compilers. • Providing better information for students – the Office for Students will develop a new website to replace the Unistats website and take the needs of disadvantaged students into account. • Reducing ethnic disparities in research and innovation funding - UK Research and Innovation is commissioning evidence reviews on challenges for equality and diversity and how they can be addressed. • Reviewing the Race Equality Charter – Advance HE will look at how the sector charter can best support better outcomes for both ethnic minority staff and students. • Encouraging institutions to address race disparities in their workforce – using tools such as the Race at Work Charter and Race Equality Charter. • Gathering evidence on what works to improve ethnic minority access and success – through the Evidence and Impact Exchange.